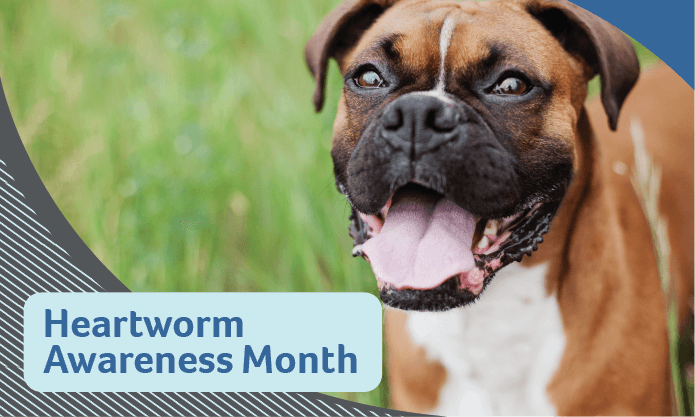 April is Heartworm Awareness Month, and we’re glad to get the chance to highlight the importance of preventing this deadly disease. Heartworms are spread through the bites of infected mosquitos, which leave larvae inside your pet. The worms grow up and live in the heart, lungs and blood vessels of infected animals. This is very serious for pets, as it can result in heart failure, lung disease and even death. This is one of the reasons we push prevention so hard. In addition, the cost and ease of the preventative treatment are much preferred to reactive procedures. We recommend and prescribe using the Heartgard medication, which helps treat other worm parasites as well. Year-round prevention is the best way to avoid those nasty heartworms, so please be aware of what you can do to protect your pets against this potentially deadly disease. We recommend monitoring your pet and having them screened for internal parasites regularly, which can be done be scheduling an appointment online or by calling (630) 297-4709.